Fr. Bill Pitcavage, SCJ, died at home of natural causes on March 22; he was 76. 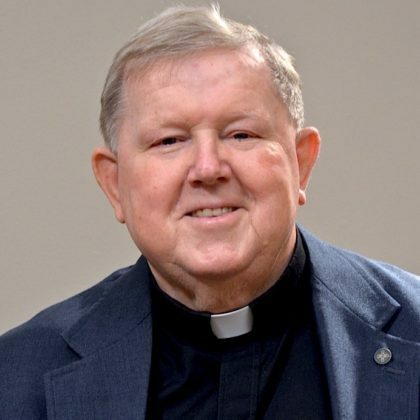 He made his first profession in 1969, and was ordained to the priesthood in 1976. He would have celebrated his 50th anniversary of vows this year. Born in Port Washington, NY, he enlisted in the US Navy soon after high school. A hospital corpsman for six years, Fr. Bill spent the first half of his enlistment on an aircraft carrier based in Rhode Island and the second half in Washington, DC. It was during his years in the Navy that he began to discern a call to religious life. In fact, he was prepared to join another congregation but after learning that they had lost all of his paperwork shortly before he was to enter, he decided to look a little further. His search led him to the SCJs’ seminary. Fr. Bill earned a bachelor’s in psychology from Loyola University in Chicago and his M.Div., from Sacred Heart Seminary and School of Theology in Hales Corners, WI. 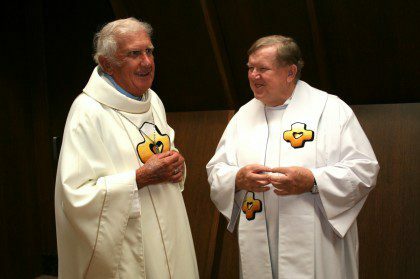 Bishop Joe Potocnak and Fr. Bill Pitcavage share a laugh. Both served in South Africa for many years. Along with his call to religious life and the priesthood came a desire to be a missionary. After a six-month internship at St. James Parish in Milwaukee, and a year-and-half at St. Joseph’s Indian School in Chamberlain, SD, Fr. Bill received his first mission assignment: a year-long stint at the Catholic Technical School of Leribe in Lesotho. At the end of the assignment he returned to the United States to serve in vocations and as a hospital chaplain. Fr. Bill returned to Africa in 1982 and was assigned to a parish in Middleburg, South Africa. Other assignments included St. Patrick’s in Port Elizabeth. He remained as a missionary in South Africa for 18 years, eventually serving as superior of what was then the Region of De Aar, from 1986-1995. In South Africa he was also chairman of the diocesan Priests Council and national director of RENEW. Fr. Bill left South Africa in 2000. He then served at St. Joseph’s Indian School and St. James parish in Chamberlain, SD. Since 2009 he had been in Hales Corners, WI, most recently as a member of the Dehon House Community, attached to the Sacred Heart Community at SHML. From 2010-2013 he was a member of the Provincial Council. Condolences quickly poured in after Fr. Bill’s death was announced. One of the first to respond was Bishop Zolile Mpambani, SCJ, bishop of Kokstad, South Africa. He and Fr. Bill had worked together for many years.